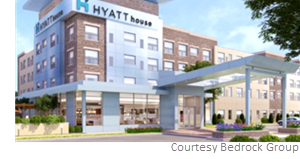 ​ SHENANDOAH – Sam Moon Group officials named ​Hyatt House as one of the hotels featured in the new MetroPark Square—a 69-acre, mixed-use development. The under construction property is at the southeast intersection of I-45 and Hwy. 242. The 160-room extended stay hotel will feature studios, one- and two-bedroom kitchen suites, and den guestrooms. MetroPark Square itself is slated to open in October 2018.